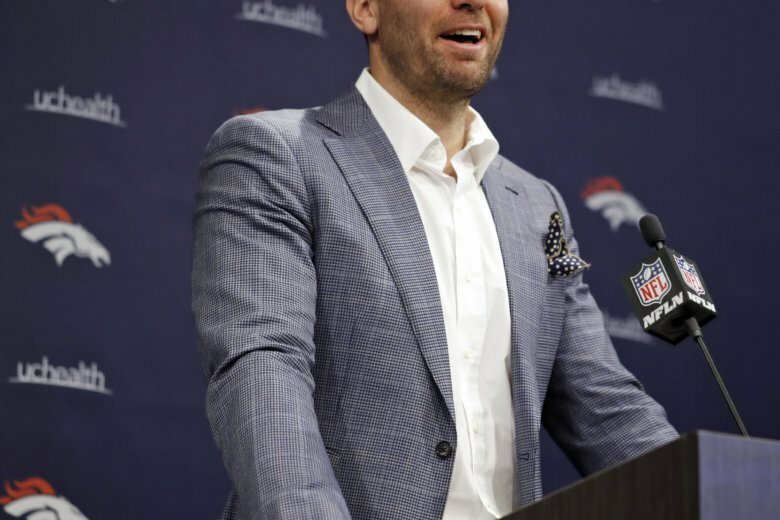 ENGLEWOOD, Colo. (AP) — John Elway insists Joe Flacco is at the top of his game at age 34 even though the former Baltimore Ravens quarterback hasn’t thrown a pass in the playoffs since 2015. That echoed comments Elway made Wednesday when he told the NFL Network that Flacco’s “arm strength is still great” and “he’s just going into his prime,” even though the veteran QB was supplanted by rookie Lamar Jackson last season and didn’t play in the Ravens’ wild-card loss to the Chargers. Elway, who sent a fourth-round pick to Baltimore for Flacco in a deal worked out five weeks ago, trusts he’s finally found a worthy successor to Peyton Manning — another Super Bowl winner who came to Denver for the second chapter of his storied career. Flacco said he’d love to reach out to Manning as he tries to follow his lead in Denver. It also appears Elway is trying hard to sell his latest quarterback acquisition to an antsy and skeptical fan base that has suffered through Mark Sanchez’s flop, Trevor Siemian’s fall, Brock Osweiler’s flounder, Paxton Lynch’s fiasco, Case Keenum’s failure and Chad Kelly’s flameout in the three years since Manning retired. No matter the motivation, Flacco appreciates Elway’s endorsement . Flacco, who’s 7½ years younger than Brady, said he’s healthy and hardy and can’t wait to get going. Flacco missed just six games in his first decade in the NFL and was Baltimore’s starter last season until he injured his right hip in a loss at Pittsburgh on Nov. 4. Jackson took over and went 6-1 to get the Ravens into the playoffs for the first time since the 2014 season. The Ravens went 106-72 with Flacco as a starter, including the postseason, where his 10 playoff victories since 2008 rank second behind Brady among active quarterbacks. Nobody has more road playoff wins than Flacco’s seven. Flacco heaved a 70-yard touchdown pass to Jacoby Jones in the final minute of regulation when safety Rahim Moore mistimed his jump while going for the interception instead of the tackle. That play represents the Broncos’ Bill Buckner moment and it propelled the Ravens to their second Super Bowl title a month later. Flacco said he’s still driven by his love for the game, not by his disappointing end in Baltimore.